What makes this croissant unique is the texture of the pastry itself . 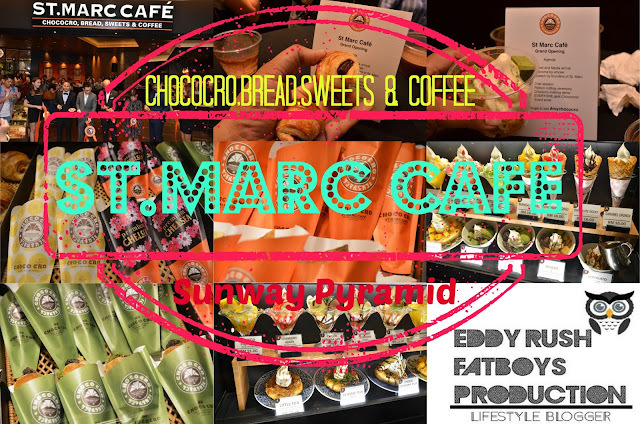 Founder Naoyuki Katayama discovered it by accident one day after skipping the fermentation process when making the croissant dough, resulting in a pastry that is denser and richer, and creating one of St. Marc Café’s bestsellers to date. In addition to the famous original chocolate version, there are currently over 100 varieties of Chococro, which are sold seasonally depending on the time of the year . St. Marc Café is also known for its soft-serve ice cream desserts, which are infused with traditional Japanese flavours and ingredients, and are a hit with children and adults alike. Café-goers can also enjoy a wide range of parfait desserts that are certain to please even the fussiest sweet tooth . St. Marc Café prides itself in creating and baking all of its pastries in-house, ensuring their freshness and quality. The café’s open-kitchen concept allows customers to see how the pastries are made, as well as enjoy the aroma of freshly-baked goods . years, Chococro has been a staple in St. Marc Café. One of the most popular dessert items in Japan. with soft-serve vanilla ice cream . Petaling Jaya, Selangor 46150 .